Howlite is a calcium borosilicate hydroxide. 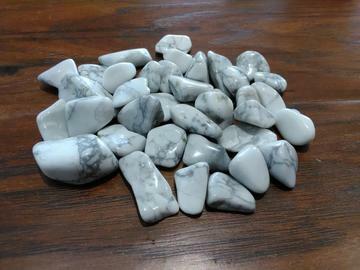 Howlite was discovered near Windsor, Nova Scotia. The most common form of howlite is irregular nodules, sometimes resembling cauliflower. Crystals of howlite are rare and have omly been found in a couple locations worldwide. Howlite is a stone to use when needing to reduce anxiety, tensions and stress. Howlite can be used to facilitate awareness, encourage emotional expression and assist in the elimination of pain, stress, and rage.